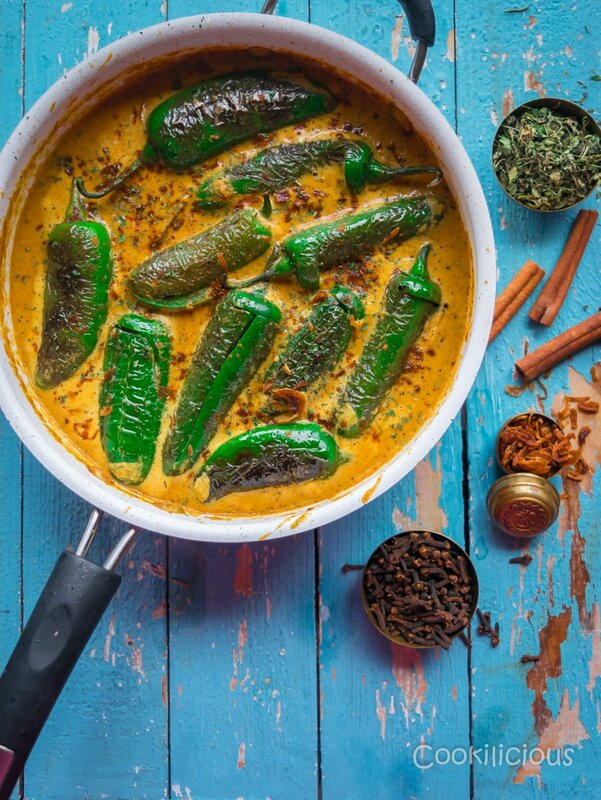 Mirchi Ka Salan or Curried Chilly Peppers is a popular chilly, coconut and peanut based curry recipe which is typically served as a side dish to the famous Hyderabadi Biryani. 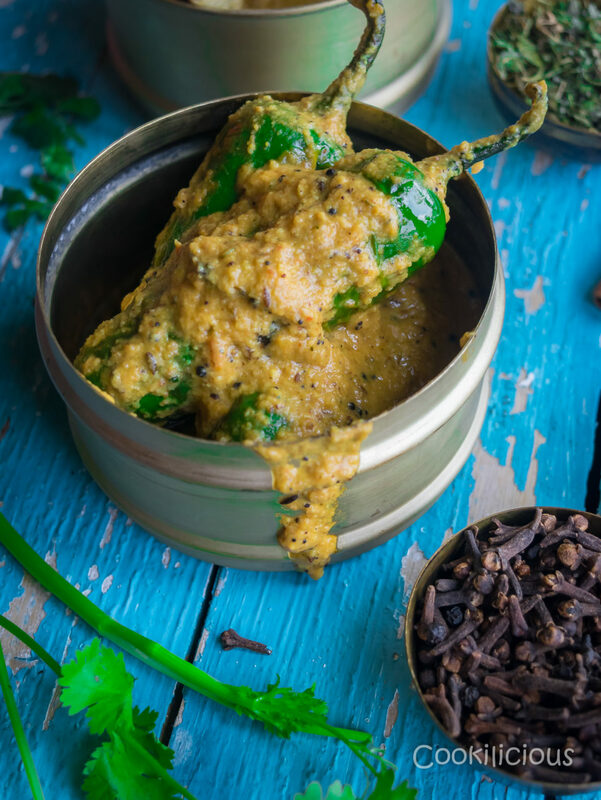 This creamy vegan dish is from the traditional Andhra cuisine and makes a great brunch. Bollywood movies continue to inspire and entertain me! I am a true Hindi movie fan and even today prefer to watch a new movie in a theater than watch a pirated CD. Thankfully there are a couple of theaters here in Orlando that play Bollywood movies which me and KR frequent every weekend nearly. It’s not just the new movies, I can watch the old ones any number of times. The idiot box which is no longer considered that is always ‘ON’ at our house. That is what keeps me company if it’s not my music system or the phone. Everyday I browse through various channels to pick a movie of interest and watch it as I go about with my other day-to-day activities. You can safely say that my life revolves around movies. It’s so much that you can ask me any trivia question about any movie/actor/song and I will answer it correctly. I may take a second here and there to answer sometimes, but I will get it eventually. I am proud of this quality in me which according to KR is, useless! There are many times when a movie inspires me to cook! Yes, I draw my inspiration from Bollywood film sometimes and create a recipe just because I saw it in a movie. This particular recipe is one of those kind. It was pouring like crazy the other day or should I say it was just a regular summer day in Orlando?! I was going on with my routine..chop chop chop click click click. The TV keeping me company was blaring in its full volume. I was watching a beautiful film based on an aged chef who owns a restaurant in London who falls in love with a woman half his age. The actors have done a great job and I love the way the narration flows. In that movie, the chef who is the main lead talks about Hyderabadi Biryani and Mirchi ka Salan. Now, I have watched this movie many times, but this particular scene never caught my attention really until now. Guess I was not a food blogger back then. I made a mental not to myself to look it up later once I finish cooking. Finally when I did take my phone in hand, a message from a friend popped up. She shared some pics of a newly opened local restaurant in Orlando. She also mentioned that her friends had been here and seemed to have loved the food. She then went on to mention that they had tasted Mirchi ka Salan which tasted great. My eyes lit up as I read her message. It was like a sign. I was thinking then that I have to make this dish for myself. I had heard of Mirchi ka Salan two times in the same day! I looked up the recipes at various sites and each recipe was little different from the other. I then decided to call my bestie’s SIL who is an amazing food preparer. She loves to experiment with recipes and is always cooking something new. She was the one who had shared her Dum Aloo recipe with me. I knew she will never disappoint me and I was so damn right. She immediately sent me her version of this recipe which I instantly liked. I knew that it’s a tried and tested recipe so the scope of failure is extremely low unless I screw it up in some way. 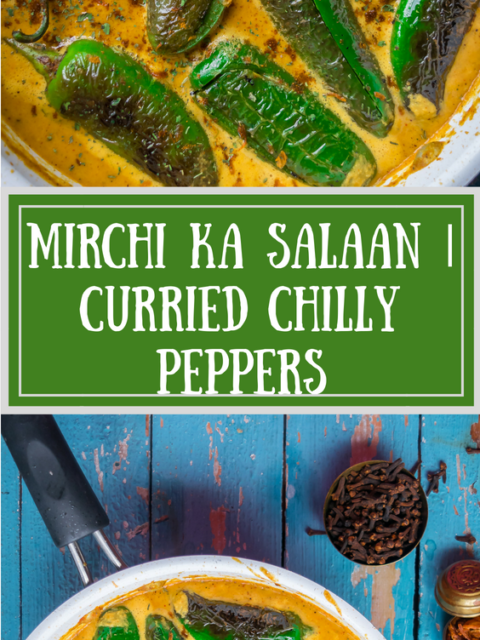 Today, I will share with you her Mirchi ka Salan recipe which is fool-proof and the best! separately. Take them off onto a plate and let it cool. Make a dry paste without adding any water. before taking it off the flame. Mirchi ka Salan is ready. I even garnished it with fried onions to give it an extra punch. This salan is not that spicy like it sounds but it’s definitely something anyone can get addicted to. You can make this dish as hot as you want it to be. But it’s not just about the spice, it is also tangy, nutty and bursting with so many flavors. This is a dish you need to make when you are in the mood to indulge. It’s not your typical weeknight dinner recipe but more of a weekend brunch meal. Since this is popularly served as an accompaniment to Biryani, I would highly recommend you to try it with that. But otherwise, it tastes great with roti and rice too. This being incredibly delicious, kids and grownups alike will devour this. Sure to be a family favorite! Time to impress family and guests with this best brunch recipe. It’s not just eye-catching but a delicious brunch recipe as well. 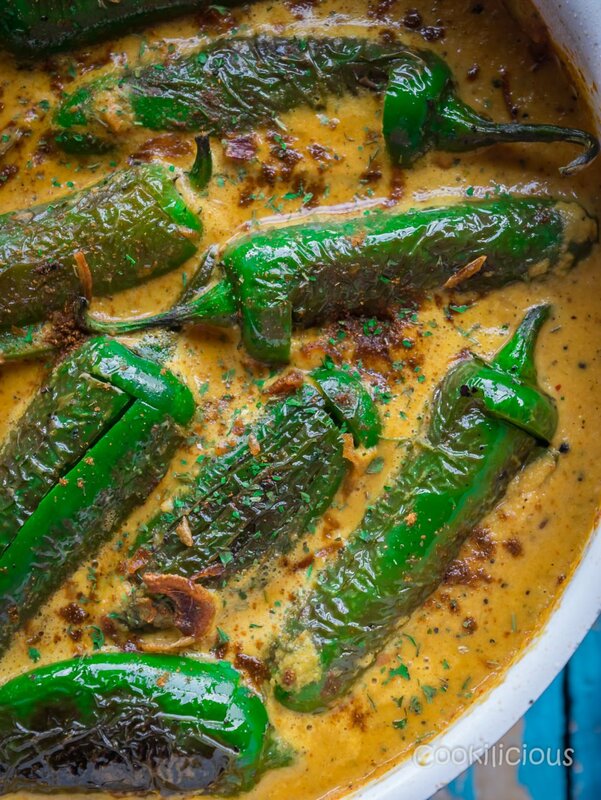 You gotta try this Mirchi Ka Salan this weekend! 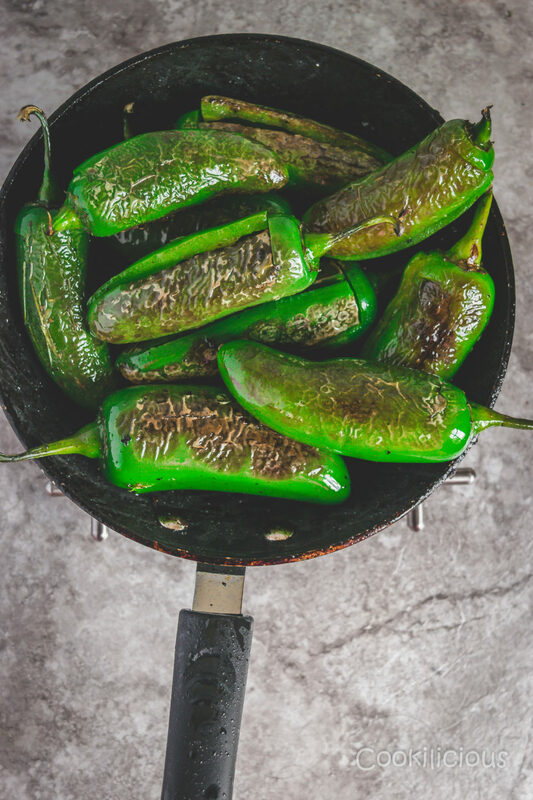 You need to get those big chillies for this recipe. Slit them and remove the stems and seeds from inside. This will remove the hotness from it. Heat oil in a pan and shallow fry the chillies evenly on all sides. Take it off the pan and keep it aside for now. Roast dry coconut, peanuts, poppy seeds, white sesame seeds, cumin seeds, nigella seeds/kalonji, fenugreek seeds and curry leaves separately. Take them off onto a plate and let it cool. Make a dry paste without adding any water. In the same pan, dry roast tomatoes, onions, ginger and garlic one after the other. Take it off the pan and let it cool down completely before grinding it to a smooth paste. Heat oil in the same pan, temper mustard seeds and cumin seeds. Once they begin to splutter add cinnamon stick and bay leaf. Fry for 30 seconds and then add the onion tomato paste. Fry for 2-3 minutes till the raw smell goes and the paste releases oil from the sides. Then add the dry spice powders like turmeric powder, cardamon powder, sugar, coriander cumin powder and red chilly powder along with salt. Mix it well and continue to fry the masala for another minute. Then add the coconut-peanut ground paste to the pan. Mix it all together, add water and cook this for 2-3 minutes till it begins to boil. Finally add the fried green chillies to the pan. Cook this gravy on sim till the gravy thickens. Add garam masala, chopped cilantro and lemon juice before taking it off the flame. Now that its summer here, its time to bring out all those grand and elaborate dishes which make a great brunch. Here are some that you can try – Burnt Garlic Fried Rice, Peshawari Paneer Chole Recipe, Vegan Pistachios & Dill flavored Turmeric Brown Rice, Mint & Pistachio Vegetable Rice, Paneer Cheese Corn Balls, Thai Mutter Paneer, Rajma/Kidney Beans Enchilada Mini Casserole, Kidney Beans Indian Stew/Rajma Masala With Spinach, Spicy Sweet Potato Tikki With Chole Chaat, Chickpea Stir Fry/Tawa Chole, Vegan Cauliflower Tikka Masala and Chilly Paneer in Tomato Capsicum Gravy. Yum! This looks so fragrant and wonderful. I can’t wait to try it!! Great assortment of spices! YUM! Cannot wait to try. This is one of those perfect recipes to prove that plant-based recipes have TONS of flavor!! Yum! This recipe is speaking my language! I love chili peppers and curry. What a luscious looking curry sauce… I love that it is dairy free! Pinning to try soon! I have been on a recent curry kick and I’m definitely adding this to my list of recipes to try. I can almost smell the deliciousness! What a great addition to a meal!